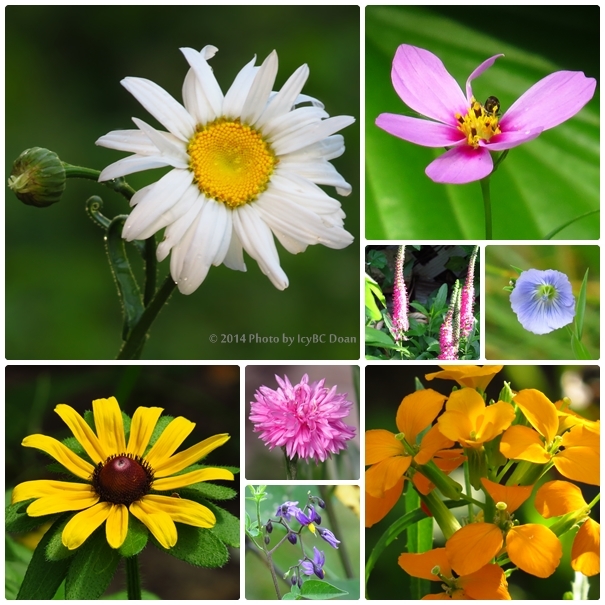 These are some of the flowers that are growing in my garden at the moment: white Shasta daisy, pink cosmos, blue weed flower, black-eyed Susan, pink mini bachelor button, night shade, and orange wallflowers. I don't know the name of the tall pink ones in the little square above. They are quite pretty, and difficult to photograph. Coming in to bloom is the gladiolus as I can see the tiny buds on the stalk. So far, I only have seen two different types of butterflies on these flowers. Have a great week.. Your garden flowers are very pretty so I'm guessing your gardens must be beautiful right now. The Shasta daisy is one of my favorites..Pretty flowers and colors, beautiful images..Enjoy your week! So many wonderful summer flowers!!! you have such a beautiful collection of flowers in your garden! !